tumour before and after treatment with Bozepinib. A team of researchers has demonstrated the efficacy of a new drug against cancerogenic stem cells, which cause the onset and development of cancer, of relapse after chemotherapy and metastasis. This drug, called Bozepinib, has proved to be effective in tests with mice. The results have been published in the prestigious journal Oncotarget. Cancerogenic stem cells appear in small quantities in tumours, and one of their important features is that they contribute to the formation of metastasis in different places within the original tumour. They remain dormant under normal conditions (i.e. they do not divide). Conventional chemotherapy and radiotherapy act upon those cancer cells which are clearly differentiated - i.e. which are undergoing processes of division - but they cannot destroy these dormant cancerogenic stem cells. Actually, after a positive initial response to treatment, many cancer patients suffer a relapse because these cancerogenic stem cells have not been destroyed. During the last few years, research in fight against cancer has focused on the search for new drugs that can selectively attack these cancerogenic stem cells. If they can be eliminated, the tumour will then be eliminated in its entirety, which will lead to the complete curation of patients. This led the researchers to develop the new drug Bozepinib. This new drug shows a selective type of activity against cancerogenic stem cells in breast, colon, and skin cancers. 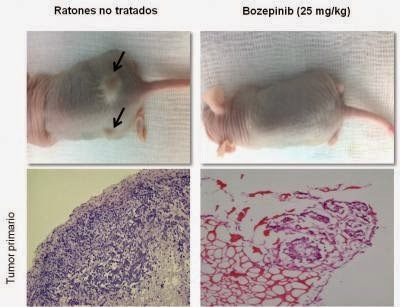 The powerful anti-tumour activity of Bozepinib is due to the inhibition of the HER2 signalling pathway, and to the fact that this drug inhibits the invasiveness and the formation of new vessels in the tumour (angiogenesis). Researchers have also revealed the specific mechanism by means of which Bozepinib acts against cancerogenic stem cells. This new drug proved to be nontoxic for healthy mice when it was intraperitoneally or orally administered, and it also inhibited tumoural growth and the formation of lung metastasis in those mice in which the tumour was induced. Researchers are currently conducting safety tests and they expect that this new drug, as well as its derivatives, can be run through clinical tests with actual patients in the near future.